In April of 1985 the Coca-Cola Company performed what is probably the most legendary and controversial new product introduction of all time. Coke had been losing market share to its archrival Pepsi for 15 consecutive years. 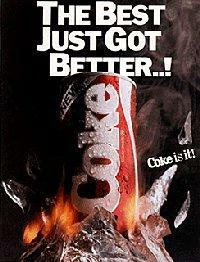 Coke’s market share had declined from a post World War II high of 60 percent down to 24 percent in 1985. The executive team was faced with the dilemma of how to revitalize a product that had been selling for 99 years. The Coca-Cola Company’s approach was to replace its primary product with a newer, bolder version that would draw new customers. A new formula of Coke’s iconic soft drink was introduced. The formula promised a smoother, rounder, bolder taste, which it was hoping would help to lift sales. Coke did extensive taste tests on the product with nearly 200,000 consumers. The test results indicated that consumers would embrace the new formula with many selecting New Coke over Pepsi. The initial launch of the product was promising with noteworthy sales volume increased in regions such as New York and Washington DC. However, there was a public uproar in the Southeastern US where residents did not approve of Coca-Cola tampering with its secret formula. Following the launch of New Coke, a vocal minority of consumers began a public protest against Coca-Cola. There were boycotts and bottles being emptied into the streets of southern cities. Over 400,000 letters were sent to Coke headquarters expressing their frustration with the formula change. Loyal Coke buyers began hoarding cases of the old products in their basement. One San Antonio man purchased $1000 worth of Coca-Cola from a local bottler in Texas. Fidel Castro spoke out against the New Coke calling it a sign of American capitalist decadence. Bill Cosby ended his contract to perform advertisements for Coca-Cola claiming that he had lost credibility by promoting the new product. After 79 days of controversy, the company announced that it would re-introduce the old formula to the market under the name Coca-Cola Classic. When the news broke, Peter Jennings of ABC News interrupted General Hospital to share Coca-Cola’s decision with the general public. The following day, Coca-Cola’s decision was featured on the front page of every major newspaper. Needless to say Coke Classic significantly outsold the new formula after its relaunch. Coca-Cola chose to keep both products on the market. The Coca-Cola Classic name was retained until 2009. The new formula was renamed Coke II in 1992, however, it never gained significant market share in the US. In 2002, the New Coke was no longer being sold on the shelves of American grocery stores. Local bottlers still have the rights and capability to produce New Coke, but only a few do. For example, Coke 2 is very popular in American Somoa and a Micronesian state called Yap. You can read the full story of the New Coke launch on the Coca-Cola Company’s web site. It is great to see that Coca-Cola provides it’s view of the story rather than trying to suppress the whole story as other companies might do. To it’s credit there is amazing consistency with the Wikipedia entry on the launch. Now let’s fast forward to 2011. Can you imagine if Coca-Cola had attempted such a formula change this year? With today’s social media tools the vocal minority would have organized in a much more methodical and impactful manner. There would have been Twitter #hashtags, Facebook pages and YouTube channels protesting the New Coke. Hacker groups devoted to the cause may have launched Denial of Service attacks against Coca-Cola. I don’t think the New Coke strategy would have lasted nine days in 2011 let alone 79. Actually, it is plausible that New Coke may never have reached market. Today’s consumer product launches typically are preceded by extensive online marketing. It is likely that a groundswell of negative feedback about the change would have surfaced earlier. Depending upon the levels of success the entire launch might have been aborted. If Facebook could take down an authoritarian Egyptian regime imagine what it could do to a major product launch.